Look, ma! No HDR (high-dynamic-range) program or HDR plug-in! That’s right, HDR fans. The opening image was created in Photoshop using basic adjustments, which I applied with Photoshop Adjustment Layers. In my how-to feature in this issue, we consider when to use HDR techniques and the capabilities of specialized software like Photomatix to dramatically expand dynamic range. Here, we’ll check out some ways to push the range using tools you probably already have. Now don’t get me wrong…please! For scenes where the contrast range is wider than a few stops, you’ll get the very best HDR results with a true HDR program. However, when the contrast range is relatively small, you can do some amazing things right in Photoshop (as well as in Photoshop Elements, Photoshop Lightroom and Apple Aperture). 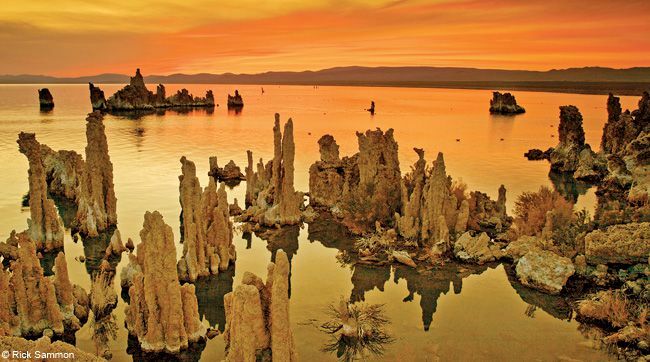 I took the opening image at sunrise at South Tufa on Mono Lake in California. It’s from a RAW file. For maximum image quality and dynamic range in a single image, you must shoot RAW files. In this column, I’ll show you the Photoshop process that I went through to create that image. Let’s go! Here’s my original digital image. The light at sunrise was nice, but not for a straight photograph. Before digital photography, if I had slide film loaded in my camera, I might not have taken this picture. However, envisioning the end result and knowing the capabilities of Photoshop, I took the shot—and man o’ man, am I sure glad I did. The Photoshop Layers panel shows all the Adjustment Layers and Layer Masks that I created to enhance the opening image. If you’re new to Photoshop, an Adjustment Layer is a method of applying an adjustment to an image without actually working directly on the image; your adjustments are placed on a different layer that can be altered or deleted without affecting your original pixels. After you apply an adjustment, you can mask out the effect by setting black as the foreground color in the Tool palette, clicking on the Layer Mask and painting over the area with the Brush tool, “painting” where you don’t want the effect to be applied. I created the following Adjustment Layers, which showed up in the Layers panel (from bottom to top): Shadows/Highlights, Hue/Saturation, Curves and Photo Filter. As a final step, I sharpened the image using Unsharp Mask. You always want to apply sharpening as the final step because other adjustments, such as Curves, Levels and Brightness/Contrast, also affect sharpness, and the last thing you want to do is over-sharpen an image.